Everyone knows that silk comforter possesses a health care effect, what can you know exactly about its benefits to human body ? First, the silk comforter promotes sleep, raises sleep quality with sedative effect. Silk protein contains 18 kinds of amino acids, 11 of which are necessary for the human body, so pure silk is good for skin, especially for sensitive skin, delicate infant skin and pruritus skin of the old. 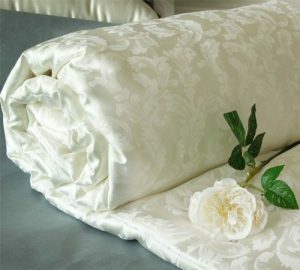 Silk comforter with silk shell can let the skin freely perspire and secrete, keep skin clean, so that we feel more comfortable. At the same time, these amino acid send out subtle molecular, also called “sleep molecular”, which can make the person’s nerve in a stable condition. silk pajamas and silk comforter can improve sleep, enhance body vitality, and slow down aging. Second, it can keep out the cold and keep in the warm. The best “silk volume void” in Silk fiber can reduce heat conduction rate when it’s cold. Silk comforter whose warmth retention property is better than that of cotton and wool naturally fit body and prevent the loss of heat due to the strange affinity with human body. On hot days it also can discharge redundant heat, so that temperature inside is moderate. Therefore, it’s warm in winter and cool in summer. The silk comforter can be used all the year around, which is incomparable by any other fiber. Third, it is anti-acarid, antibacterial and antiallergic. SERICIN ingredients not only can make a person’s skin exquisite and smooth, but also prevent the propagation of mites and germs, more beneficial to allergic constitution. What’s more, silk fibroin contains a kind of “affinity side chain amino acid”, which can absorb the moisture in the air, and then eliminate in as to maintain dry and keep comfortable inside the comforter, especially good for rheumatism patients. 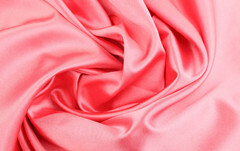 All in all, Silk is soft, smooth and incomparable close-fitting, which make it the number one without any rivals. 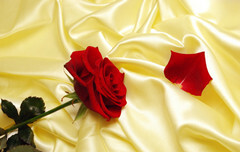 Silk known as the “fiber queen” can really make human body and heart get the best care and enjoyment. Next ArticleFold the quilt everyday, good or not?